Worldwide coverage through the main air lines. 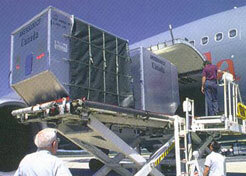 Air transport is idoneous for goods they are limited by volume and weight, urgent, perishable or of high value. GTFco has a net of agents net throughout the World and agreements with the main air line companies within allow us to supply a worldwide service. GTFco also does haulage deliver or pickings up goods from/to any agreed location. Containers, less than a container load, projects and charter vessels. Fricke means of. A door to door transport. Logistics additional services and complements to logistics. Steps, insurance and storages.